From bright green leaves to rich red leaves, from hot, humid days to crisp, chilly afternoons, from lightweight dresses to chunky sweaters, from strappy sandals to knee high boots… autumn days are here again. Hands down, autumn is my favorite season. I love the changing leaves, the cool air, the pumpkin spice lattes, and of course the fall fashion. One thing that I don’t love about the month of October, the heart of the fall season, is midterms, which is why I have been so absent from my site. Once October hits, I spend the majority of my days and nights writing essays and studying for midterm exams. This leaves me little to no time to explore, take photos, and upload to my blog. Luckily, the next few weeks of the semester are not as hectic. Well at least I hope. 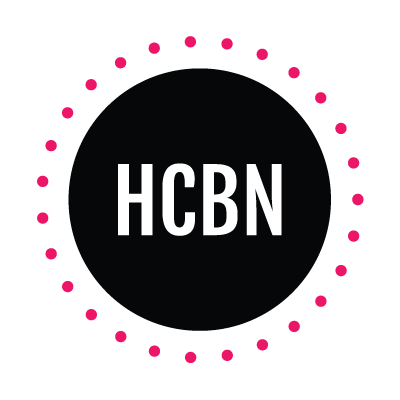 So more blog posts are coming your way. 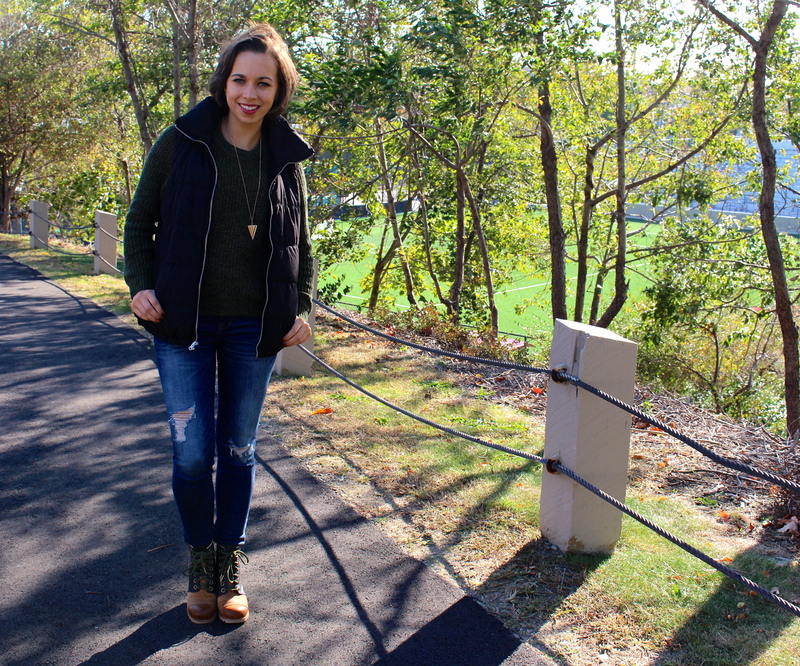 Lately, my fall wardrobe has been looking like this: jeans, sweater, vest, and boots. Can’t go wrong with that combination. My cropped sweater is from H&M. I love everything about this sweater, especially the deep green color, the high neck, and the length. Turtlenecks and high necks are so “hot” for the fall season. Although this sweater is super warm, I decided to add more layers for those cool mornings when I am walking to my early classes. I used to hate vests because I found them pointless without sleeves, but I must have turned over a new leaf (no pun intended) because I am obsessed with vests. 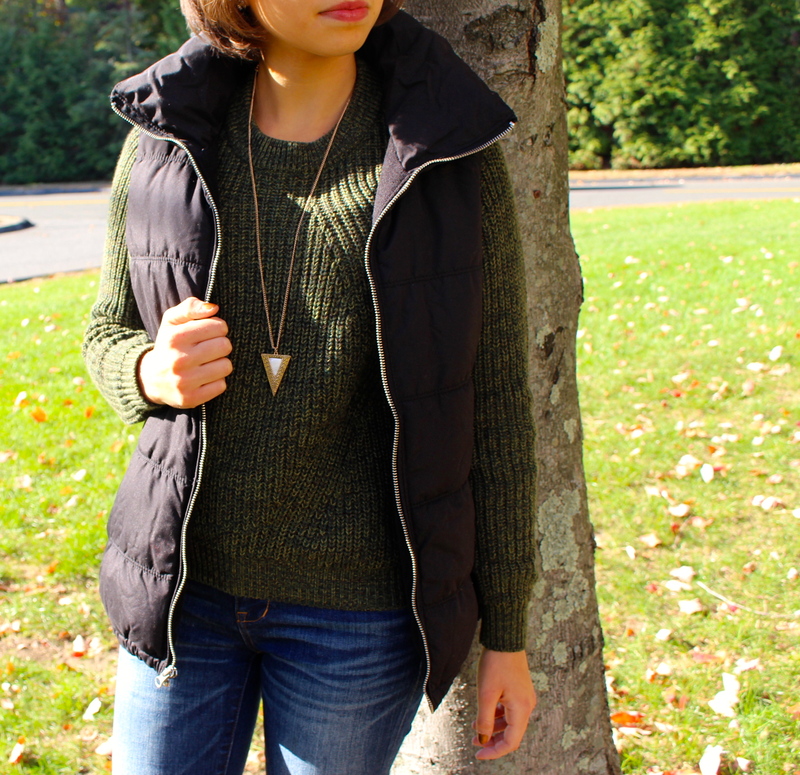 My black, puffer vest from Old Navy is the perfect addition to any outfit. The best thing about this vest is that it is lined with fleece making it a great transition piece for fall. My favorite pair of Madewell skinny jeans completes this fall look. As for accessories, I decided to wear a long, triangular shaped necklace from Forever 21. A little extra bling didn’t hurt anyone. I saved the best for last…my shoes. 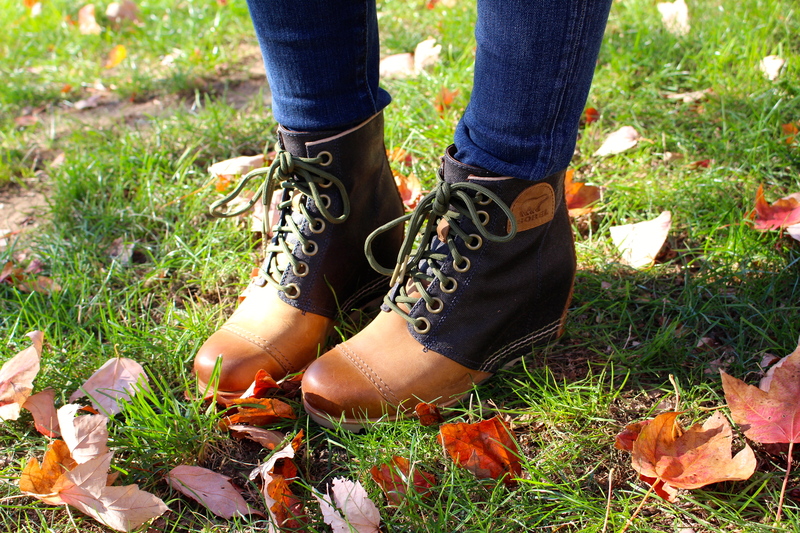 These 1964 Premium Wedge Boot from Sorel is everything I look for in a shoe…style, comfort, and a little height. These Sorel boots are the perfect combination of leather and canvas and are waterproof for those unexpected fall showers or even worse, those early snow flurries. I love the black, tan, navy, and green colors featured, hence why I wore a green sweater to bring out the color of my laces. 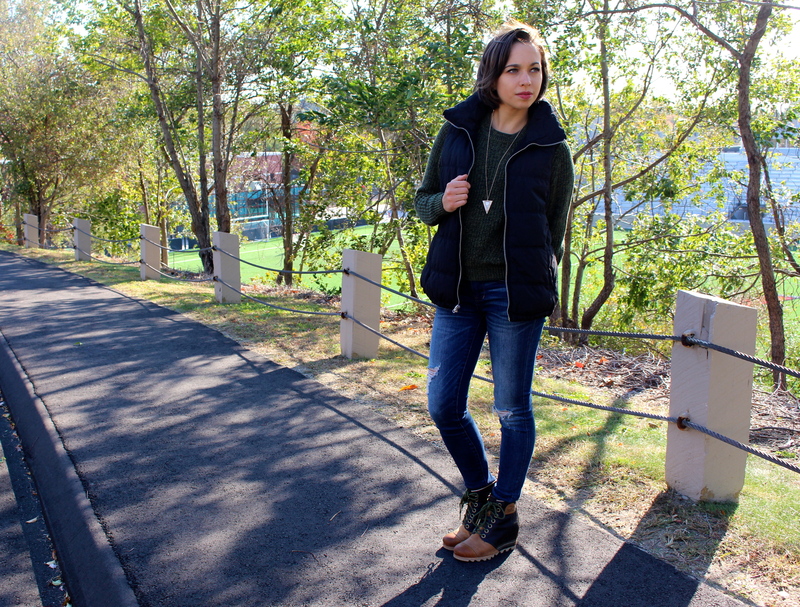 Lately, I cannot style an outfit without incorporating my Sorel boots because they are best for autumn days. I hope everyone is enjoying the fall season. Tis’ the season to jump in a pile of leaves, carve a pumpkin, go apple picking, but no matter what you do, enjoy the autumn days because before you know it winter will be here, and that’s my least favorite season. You are too cute! I love Sorel boots! They are always so warm & comfortable! Very nice pictures! Loving the outfit. What a lovely post to read!